For a PCB version of this project see ATtiny10 Thermometer PCB. Some time ago I designed a flashing thermometer based on an ATtiny85, using the ATtiny85's internal tempreature sensor: Flashing Thermometer. Despite its elegant simplicity the circuit wasn't very accurate, because of the limitations of the internal temperature sensor. I recently wanted to build another thermometer, and decided this time to base it on a DS18B20 1-wire temperature sensor that has an accuracy of 0.5°C and doesn't require calibration. I decided to use an ATtiny10 for the processing, so I could eventually make a version with SMD components on a PCB the same size as a button cell. For this prototype I used through-hole components and an ATtiny10 on a breakout board. The original flashing thermometer displayed the temperature in a little-known notation called negabinary. This time I've also supported an alternative notation I've called Easy Binary that you may find more intuitive than negabinary. In each case it flashes the digits starting with the most significant digit, with red representing a one and green a zero. Positive temperatures are given in binary, with no leading zeros. Zero is given as one zero. Negative temperatures are given as one zero followed by the binary for the positive number. Three temperatures represented as a series of flashes in "Easy Binary" notation. Multiply your total by 2. Add the value of the flash (green=0 or red=1) to your total. When there are no more flashes your total is the decimal value of the number, or minus that number if the first flash was green. Negabinary notation which is ideal for this application, and gives a very compact way of expressing the temperature. If you know binary you should find it easy to understand. Negabinary is similar, except that it uses the powers of -2 rather than the powers of 2. So each bit represents the power of -2 corresponding to its position. So what's the point of negabinary? Its advantage over binary is that it can represent both positive and negative numbers in a consistent, compact way. This is exactly what we want for temperatures, because the temperatures we are measuring tend to be either side of zero. Three temperatures represented as a series of flashes in negabinary notation. When there are no more flashes your total is the decimal value of the number. The circuit is based on a DS12B20  temperature sensor in a TO-92 transistor package, which has a supply range of 3.0V to 5.5V; you can also find them very cheaply on Chinese sites. The MAX31820  is equivalent and cheaper, but has a maximum supply voltage of 3.7V. The ATtiny10 is in an SOT-23 package, so I mounted it on a small breakout board . 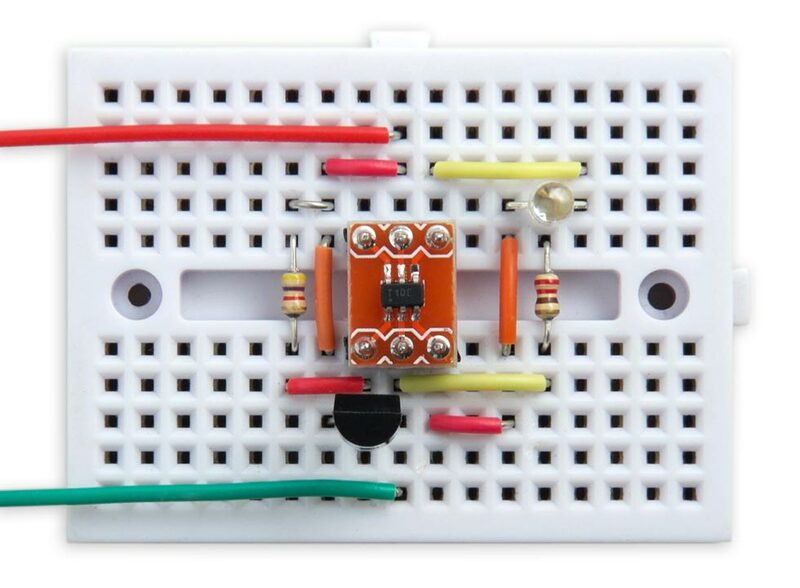 I built the circuit on a mini breadboard, available from SparkFun  or HobbyTronics in the UK . Since there is only one device on the bus you can ignore the serial number, and just send a Skip ROM command which sends subsequent commands to any device. The DS12B20 or MAX31820 returns the temperature as a signed 16-bit integer in units of 1/16th of a degree. It uses the variable zeros to suppress leading zeros unless the number is zero, in which case it gives a single green flash. If the 1-wire interface fails to find a 1-wire device on the bus it gives a 1 second red flash. If the 1-wire interface gets a CRC error in the data read from the temperature sensor it gives a 1 second green flash. The thermometer uses the following power-saving features to ensure that it will last as long as possible on a single battery. Most of the power is consumed by the LED. I chose a high brightness two-colour LED so it would be visible even with very short pulse durations - it's only on for 12msec, but is still clearly visible. Whenever the thermometer is not measuring or displaying the temperature it puts the ATtiny10 to sleep, reducing the power consumption to 5.5µA. The processor sleeps for 16 seconds between each display of temperature, and for 1 second between each flash. In each case the processor is woken from sleep using the watchdog timer, which generates a watchdog timer interrupt after a specified delay. This enables the watchdog timer, and the parameter n sets the watchdog timer prescaler. A value of 0 gives a 16 millisecond delay, a value of 6 gives a 1 second delay and a value of 9 gives an 8 second delay. While asleep the current consumption is negligible (5.5µA at 3.0V). When lit the LEDs consume about 5mA, but they are only lit for about 60ms every 16s, which is a duty cycle of about 1:266. This is equivalent to a battery life of about 500 days for a CR2032 button cell with a capacity of 225mAH. The main program sleeps for 16 seconds, and then flashes the temperature in the chosen notation. The whole program takes 774 bytes, so it easily fits in the 1024 byte flash memory of the ATtiny10. I uploaded the program to the board using the USBasp programmer. For more details about the procedure see my earlier article Programming the ATtiny10. Note: You need to remove the temperature sensor from the circuit while uploading to the ATtiny10 as it interferes with the upload process. Here's the whole ATtiny10 Thermometer program: ATtiny10 Thermometer Program. ^ 6 pin SOT-23 to DIP Adapter PCB on eBay.